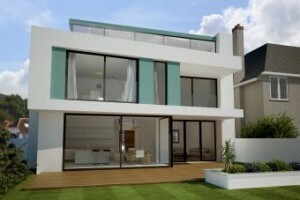 Borough of Poole: Pure Town Planning recently celebrated another victory in Poole after receiving planning permission for a new large detached family dwelling with harbour views across Poole Park. The approved scheme replaced a relatively small bungalow with a three storey, 5-bedroom family dwelling which took full advantage of its prestigious location and fantastic sea views. This planning consent followed a previous application which was refused by the Borough of Poole for being out of character with the established pattern of development. Pure Town Planning along with Tony Holt Design successfully developed a revised scheme which together with some negotiation with the appointed planning officer overcame the reasons for refusing the previous proposal. The new design proposed a shape, form and style of architecture that the Council considered would sit more comfortably in the street scene. The timing of the approval was critical – it needed to be approved before Christmas in order to avoid the Community Infrastructure Levy which came into effect in Poole on 03 January. Unlike most Section 106 contributions, CIL applies to replacement dwellings and even domestic extensions where there is a net increase in floor space over 100 sqm. If you are planning a similar development and would like a firm of planning consultants to push your proposal through the planning system to a successful conclusion, then please do not hesitate to contact us to find out how we can help you.